some call it cap toe...some call it toe cap. i'm not really sure which is correct, but what i do know is that it's EVERYWHERE. shoes were seen on the runway embellished with metal, glitter and patent and now a ton of diy's have been surfacing the web (via chriselle factor & green wedding shoes). with pastel being a huge trend for spring i found myself lusting over the louis vuitton merry-go-round pump in alligator from their spring/summer 2012 collection. i loved the mixture of the soft pastel yellow with the metal toe cap that gave it a bit of edge. as much as i would love to rock these on my feet...it would cost me a whopping $9,950!!!! 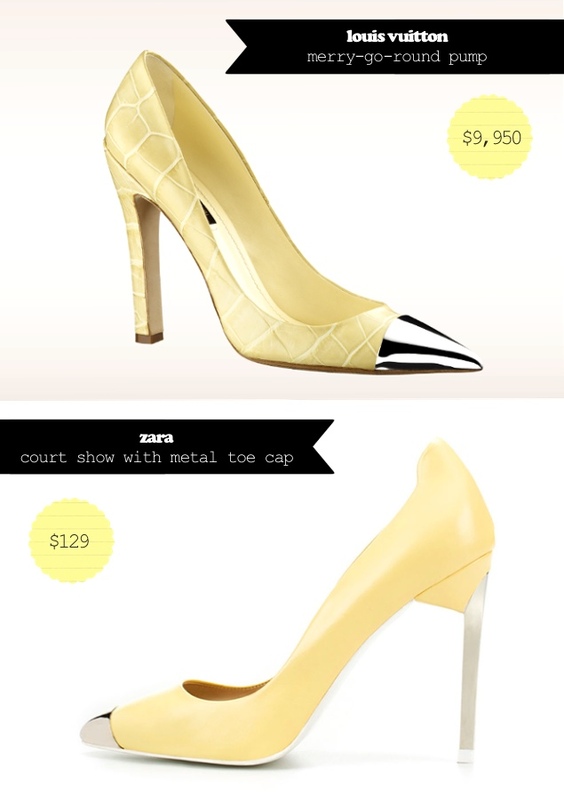 they do carry the merry-go-round pump in leather (rose,blanc,marine) for $1,000...but that's still pretty steep. plus, after my last splurge i should probably lay low on the shopping. but, as an alternative...i did find a pair from zara for $129 that came pretty close to the pair of louis vuitton's (minus the alligator skin) and wouldn't put a dent in my wallet. not only does it have the metal toe cap but a metal stiletto! i'd have to say that that's not a bad looking shoe for $129! wouldn't you agree? Those are some fierce shoes! Of course, I'm all sorts of curious to see how you would style them. It would be good, I'm sure.